*On-going Master Acting Classes – start a session on the 1st scheduled day of the month. A Minimum 3 month Commitment is required. At Penny Templeton Studio, we provide acting classes for the working actor as well as the beginning actor who’s just starting out. We are looking for devoted actors who want to take their craft to new levels. Our approach is to fully commit to our actors. We mentor our actors. We give you everything we have and in return we expect the same. 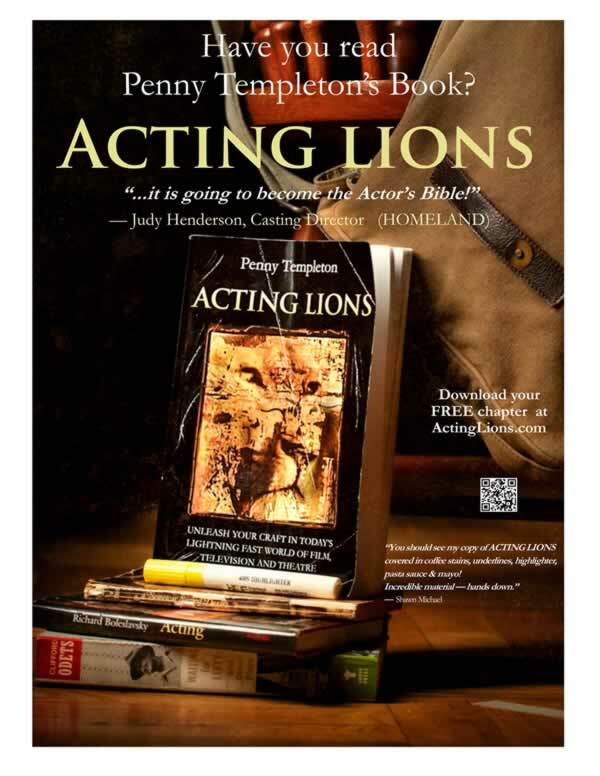 The result: Actors with the approach, skills and tools to be “Acting Lions”. We teach individual actors within each class. While there are universal concepts to the acting technique, each actor is a unique individual who needs nurturing and personal attention. Acting has drastically evolved from the days of Stanislavsky and the Group Theater, when techniques were geared for the actor who would rehearse many months. As the business began speeding up, theatre rehearsal time has been drastically reduced. Rehearsals for Film and Television have been virtually eliminated. What hasn’t evolved is the way the craft taught to be used by they actor. It isn’t working for actors the way masters had intended. Stanislavski said the acting technique needs to be a living breathing process that grows to meet the ever-changing demands placed on actors today. One of the great misconceptions is that the “Craft” is only for theatre, when in fact today, actors go from theatre to film to television, and the craft must go with them. Today’s actor is under constant pressure to deliver the goods faster and faster. What should be a collaborative effort can feel like a battle to survive. How does an actor make themselves vulnerable,and access deepest emotions, while being rushing to get the shot before they lose the light? Penny’s passion for the craft led her to develop her approach to acting that is grounded in the teachings of the great masters, and yet prepares and equipts actors for success in the reality of today’s acting profession. Her classes have been arming actors for over 25 years with this ever evolving exceptional approach to the craft. Preparing them to excell as an artists in this fast paced world of acting. Our actors are always ready to act. They face challenges. In fact, because they are prepared they relish them!